Let's go on the record, that I am not one of those "chocoholic" girls. Far from it. As a kid I did not even like chocolate. Still can't stand chocolate icing, chocolate shakes or chocolate ice cream. Not my thing. I am a vanilla, caramel or fruit girl. I do like my chocolate with cinnamon, nuts, caramel, salt (see salted macadamia caramels from Costco) and dark. If Greg brings me home Mozart balls (hazelnut) or truffles from Europe they will be carefully portioned out for maximum enjoyment. First I'll have a small pity party that Greg keeps going to Europe without me and all I get are chocolates and a nice quiet house, but then I get over that (it's not like he is touring the countryside and going to museums) and just enjoy the luxury of them. 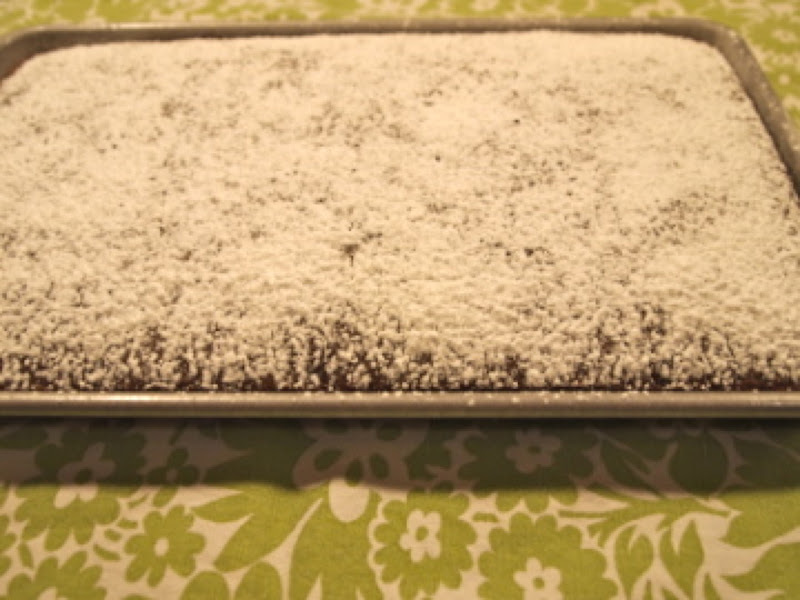 Here's a chocolate recipe I actually do like, Texas Sheet Cake. Again, it's adapted from Cooking Light. I've been making it for probably ten years. Most people would frost it with chocolate icing and sprinkle on pecans. Go ahead, but it's easier to take somewhere and still delicious if you just let it cool and generously sprinkle powdered sugar on top. I think I'll try a pinch of sea salt across the top some time too. Could be just the thing. Give it a try. 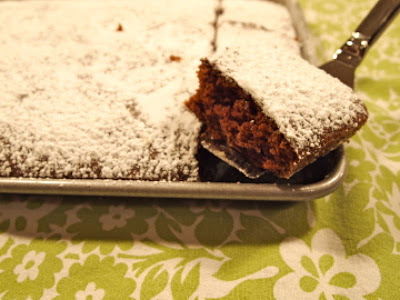 I use my stoneware jelly roll pan from Pampered Chef. Love that thing. Perfect for this recipe, but a 13 x 9 x 2 metal pan (get the one with the lid) will also work just fine (and then you don't have to plate it). Soooo ready for college football! Preheat oven to 375 degrees. Coat a metal jelly roll pan or 13 x 9 x 2 metal baking pan with cooking spray and dust with flour. Tap off excess. Set aside. Combine flour, sugar, soda, cinnamon and salt in a large bowl (use your mixer bowl if mixing other than by hand). Whisk to combine. In a small saucepan, combine water, butter and cocoa and bring to a boil, stirring frequently. Add to flour mixture. Beat at medium speed with an electric mixer or blend well by hand. Add buttermilk, vanilla and eggs and beat well. Pour batter into prepared pan. Bake at 375 degrees for 22 minutes or until tester comes out clean. Cool on a wire rack. When cool, generously dust with powdered sugar.